One suspects the pile of rejection letters sent to writers throughout history could stack itself to the Moon. 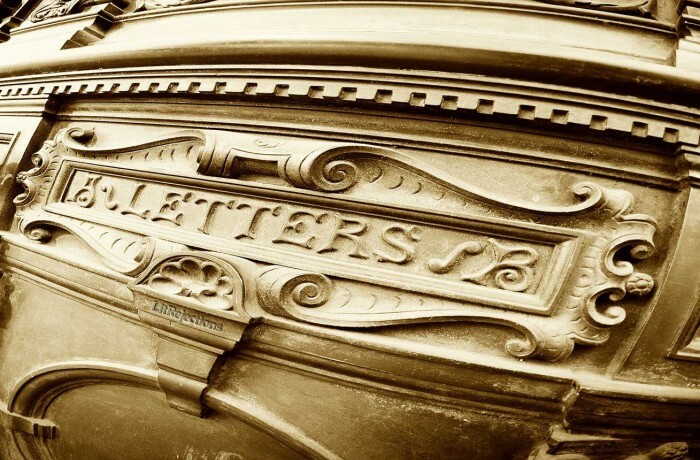 These standardized impersonal responses to years of work often mean they are either thrown out, or archived in storage, far away from the writer’s desk. Consequently, very few writers feel the need to share their rejection letters with their colleagues. The vast majority simply do not want to admit that their work was dismissed out of hand. This makes obtaining original copies quite a challenge for any collector. Furthermore, with an increasing number of rejections now sent via e-mail, publishing them on a site can prove to be difficult. However, once a writer is published, they are more inclined to share them in any format. Some even put them on their own website to illustrate either how far they have come, or how wrong the rejections were. The examples below will expand as the website itself progresses. I am only one, only one, only one. Only one being, one at the same time. Not two, not three, only one. Only one life to live, only sixty minutes in one hour. Only one pair of eyes. Only one brain. Only one being. Being only one, having only one pair of eyes, having only one time, having only one life, I cannot read your M.S. three or four times. Not even one time. Only one look, only one look is enough. Hardly one copy would sell here. Hardly one. Hardly one. Many thanks. I am returning the M.S. by registered post. Only one M.S. by one post. 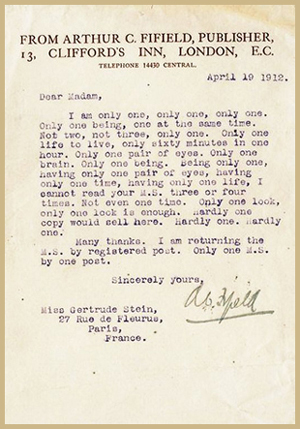 The stream-of-consciousness style of Gertrude Stein was such, that this Editor’s letter goes to great length to reject her in the same style. Stein had yet to light up the Parisian literary scene, so the response from Arthur C. Fifield was understandable. 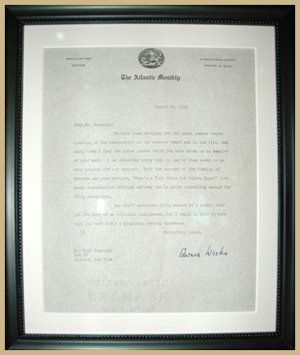 Despite Stein going on to become a best-selling writer heralded by Ernest Hemingway, this rejection letter has also stood the test of time, and remains one of the greatest. Keen to see his work in print, Edgar Rice Burroughs, as was the fashion, decided to offer his manuscript to The All-Story Magazine for serialisation. They initially saw no value or future in the story. Burroughs persisted and in October they agreed to print the first instalment. 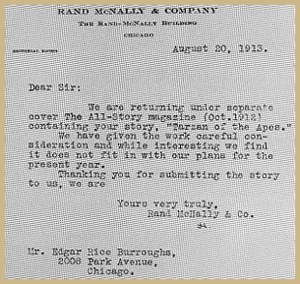 Two years later in 1914 Tarzan of the Apes was published as a novel by A.C. McClurg. It became a cultural sensation with countless adaptations for the screen. If Burroughs had quit after this initial rejection letter there would be no Tarzan. The sale figures further reinforce his decision to persist: Tarzan of the Apes has gone on to sell 50 million copies. We have been carrying out our usual summer house-cleaning of the manuscripts on our anxious bench and in the file, and among them I find the three papers which you have shown me as samples of your work. I am sincerely sorry that no one of them seems to us well adapted for our purpose. Both the account of the bombing of Dresden and your article, “What’s a Fair Price for Golden Eggs?” have drawn commendation although neither one is quite compelling enough for final acceptance. Our staff continues fully manned so I cannot hold out the hope of an editorial assignment, but I shall be glad to know that you have found a promising opening elsewhere. Kurt Vonnegut liked to collect his rejection slips and letters, and this one from The Atlantic Monthly in 1949 is a very revealing one about a writer’s voice. Vonnegut had survived the bombing of Dresden as a POW, and his personal account of it still was not “compelling enough” for print. He had yet to find his voice as a storyteller. Despite this early setback he continued to write through a teaching career until his debut novel Cat’s Cradle became an instant best-seller in 1963. This was followed just six years later with a novel often citied as one of the greatest of the 20th century: Slaughterhouse-Five. Ursula K. Le Guin writes extremely well, but I'm sorry to have to say that on the basis of that one highly distinguishing quality alone I cannot make you an offer for the novel. The book is so endlessly complicated by details of reference and information, the interim legends become so much of a nuisance despite their relevance, that the very action of the story seems to be to become hopelessly bogged down and the book, eventually, unreadable. The whole is so dry and airless, so lacking in pace, that whatever drama and excitement the novel might have had is entirely dissipated by what does seem, a great deal of the time, to be extraneous material. My thanks nonetheless for having thought of us. The manuscript of The Left Hand of Darkness is returned herewith. 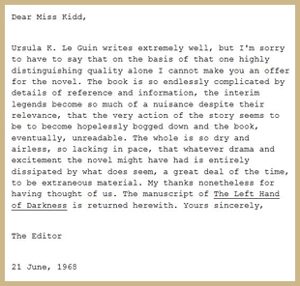 This letter sent to the literary agent of Ursual K. Le Guin, from an unknown publisher shows just how much the reading of a manuscript can be one of personal preference. The publisher claimed the book was unreadable and would therefore find no success in the marketplace. Perhaps the publisher did not like the genre. Perhaps they were having a day of misjudgement. The Left Hand of Darkness became an instant best-seller and is now regarded as the second best fantasy novel of all time, next to The Lord of the Rings. The studios of Hollywood have always produced the most impersonal rejection slips that a writer will receive. To this day, the practice continues as screenwriters receive blunt responses from the pool of readers who work for the major studios. As with all writers, they long for constructive criticism to help them make the necessary changes. This very rarely occurs unless they pay for a reader's report, and even then boxes are ticked, and scores are given. In some cases these writers are told to be 20% funnier, or make their protagonist warmer. This rejection slip sent by the Essanay Film Manufacturing Company in the early days of the studio system demonstrates just what screenwriters have had to endure in response. If these slips were adopted by the book industry today it would incense writers. 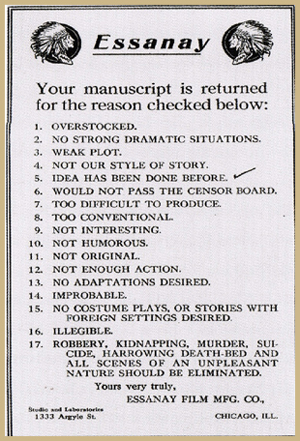 One can imagine how unpublished crime-fiction authors would react to a ticked 17.